I know the anticipation is killing you. Drum roll please . . . The thing that just had to come home with me from the barn sale was . . .
She’s a Murray and I sort of fell in love with the fin on her front wheel. I have it on good authority that the people at Murray were the first to use the double-decker system on the back. So your brother could hop a ride on the back and you could pedal real fast and then stop suddenly and throw him over your shoulders where he would tumble head over heals onto the gravel. No, I have no personal knowledge of that. The first year they started producing that double-decker style was in 1960. So, as much as I like to think it looks more like a 40’s model, it can’t be that old. And I didn’t even mind that she doesn’t have all her rubber tires. That’s part of her charm. I like to think that she was so well loved and ridden so hard that her tires just flew off of her wheels one day. The other thing I bought was the round galvanized tub/bucket. I bought it to plant some flowers in, but, to tell you the truth, I’m getting a little tired of watering my planters this year, so I may just skip the flowers and use it to hold dog toys on the back porch. Oh, and that oblong basket was bought at a yard sale later that same day. I thought it would look cute as a basket for Trixie. It just looked childish though and who needs a childish looking tricycle? So what are your thoughts? Should I keep Trixie outside as garden decor? Or is she too damn cute and needs to be displayed in my house somewhere? I love Trixie, inside or out. what moves you??? Oh good, you got the trike! I love these things outside in the yard or garden and I have 2 not nearly as cute as this one. The least pretty sits on the front porch but the nicest I keep inside only because of the humidity. I hate to see it turn to rust with our rain and wet air so that may be a consideration for your Trixie…hate to see her rust she’s so pretty! Trixie will be wonderful wherever she goes…what a wonderful find! 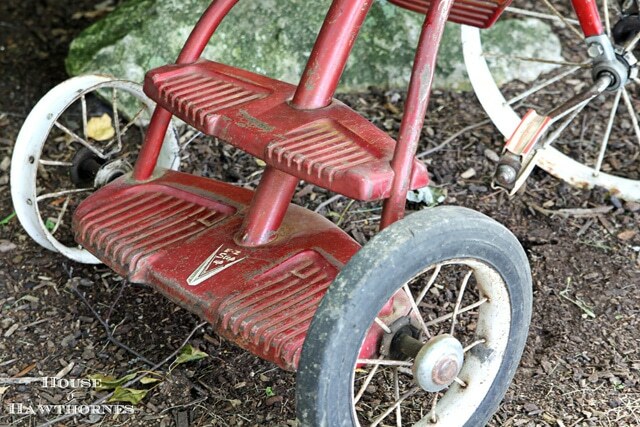 I don’t have an old trike like Trixie but I wish I did! She needs to be ridden!! The 4th of July parade is calling you. Pam….We’re ready for you to lead the parade! But seriously, in front of the fireplace, on top of an old cupboard, anywhere you put her, she’ll shine. Oh, I think the gal would be cute as garden /yard decor. Lovely! I would love to have one like this. Cool! I still have my metallic purple bike from the 70’s and it’s a double decker, too! I’m thinking along the lines with NanaDiana. A protected spot outside would be great. 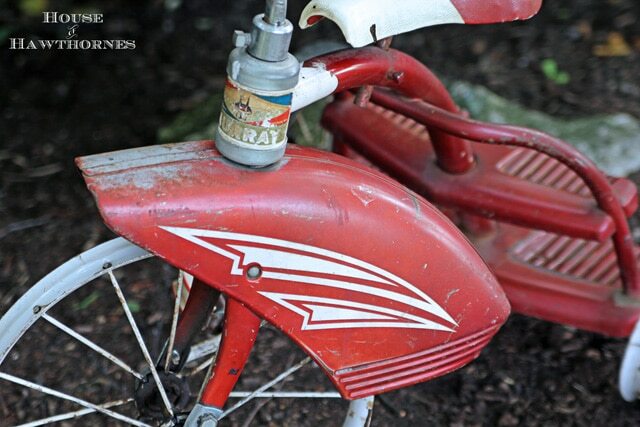 What fun the old metal tricycles used to be! It has been a long time since I’ve seen one. The big plastic safety- engineered ones just don’t compare, especially when it comes to thrills and spills. 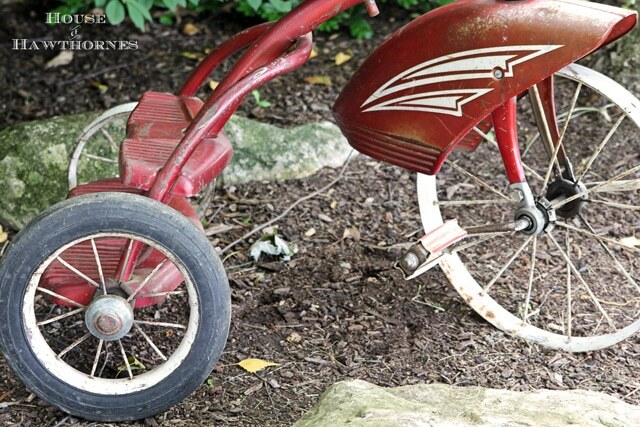 I love the trike–it would look great outside…but maybe when the weather is bad bring it inside. So cute! Love your galvanized tin bucket, but I LOVE Trixie. I have two photo in a frame together. One is my husband and his brother at 3 and 5 years old riding their little car and fire engine. The other is my sister (5 years) on her trike and me (3 years) standing behind her. 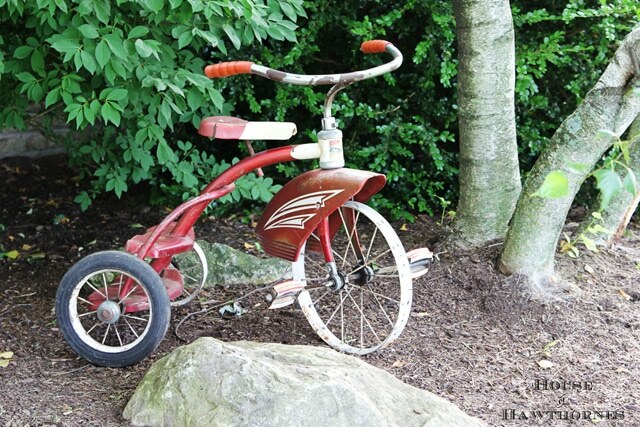 It would be so fun to have a trike in my garden. Pam, I just LOVE Trixie! I would use her outside in the summer and inside during the winder so you can totally enjoy her all year. I am a Mad Men fanatic and that season finale was pretty awesome, wasn’t it?? Thanks for sharing with us! Have a great week! Pam, what a bunch of good finds ! I wish I still had the green trike I had as a little girl. But I did find a Murray at a little shop a few months ago and snapped it up. I knew it was a good price and wasn’t going to leave without it! It’s in the garden, but I may bring it to the porch for protection. Love the bike. I swear I had one close to this growing up. 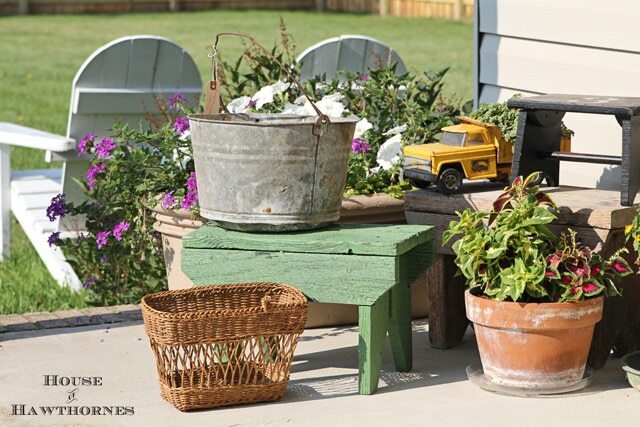 Your galvanized tub/bucket would have made a fabulous watering hole for Josie’s western party! Trixie is too cute! I can especially see her at Christmas time with presents surrounding her! What a perfect vignette that would be! oh my gosh, adorable. I hope you have her all decked out for the 4th! !